You know how much I love a good old Pinterest competition. I’ve run a few here on the blog, and have loved watching the boards come to life and have spent hours sifting through them to find my favourite. 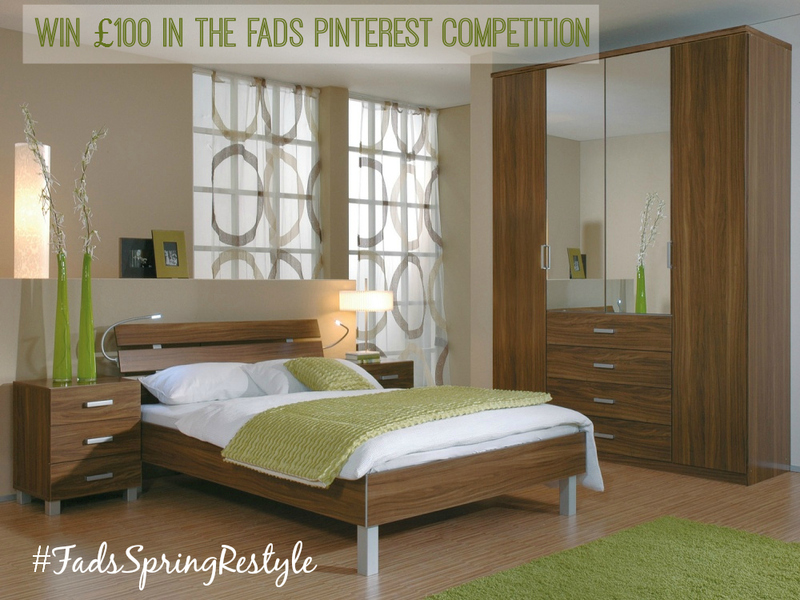 Today, I want to tell you about a cute little competition that FADS are running from their blog, where you can create a Spring Restyle Pinterest board, for the chance to win £100 to spend at Fads. So, how about a little inspiration for this competition. Fads have used this image above as the basis for their Spring restyle. A lovely new set of bedroom furniture, with some gorgeous green accessories. It’s simple and stylish, but what would you add to your home to give it a little restyle this Spring? I’m currently giving the bathroom a mini makeover (yes, we are finally getting on with it). The paint is almost on the walls, and I’ve ordered a brand new faux wood venetian blind. Now I’m looking for accessories, and I’m inspired by Spring colours. I love these fresh greens, bright blues, and zingy yellows. With the walls a pale grey/blue, some extra colour in the towels and other accessories will really lift the scheme. With the Easter weekend pretty much upon us now, the biggest DIY weekend in the British calendar has arrived. What are you planning to do your home this weekend? Perhaps you could use this competition as a moodboard for your restyle? Collating your ideas, and seeing them all in one place like a Pinterest board, is the best way to focus your mind when you’re choosing items for your revamp. It also gives you a great idea of how the finished result will look. I for one, find it tricky visualising how my ideas will transform a space and often use Pinterest for this very thing. So, if you fancy giving the FADS Pinterest competition a go, why not take a quick read of the full instructions on the Fads Blog, and start putting together your Spring Restyle board. You still have over a week to get your entries in; competition closes on 27th April.